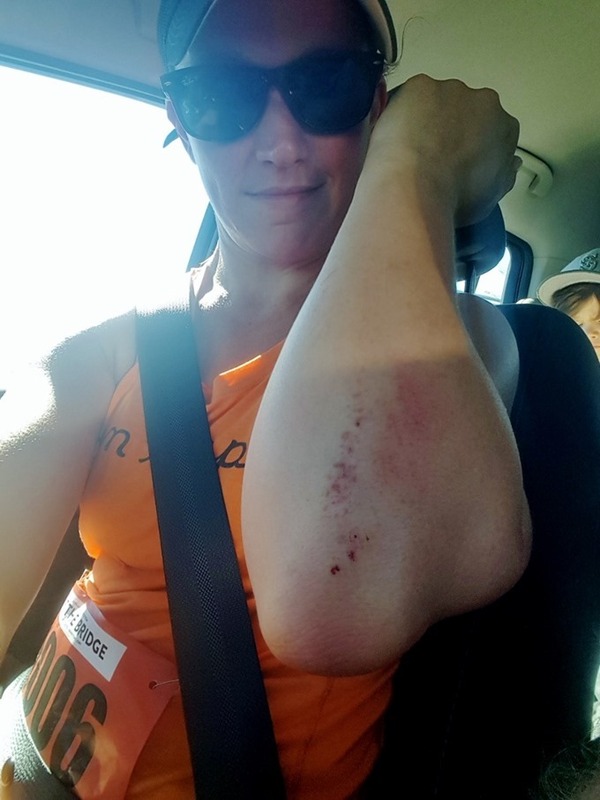 This weekend I ran my first ever Beat the Bridge 8K! It’s a huge race here in Seattle, so I have no idea how it has taken me six years to finally do it. But now I can check it off my list! 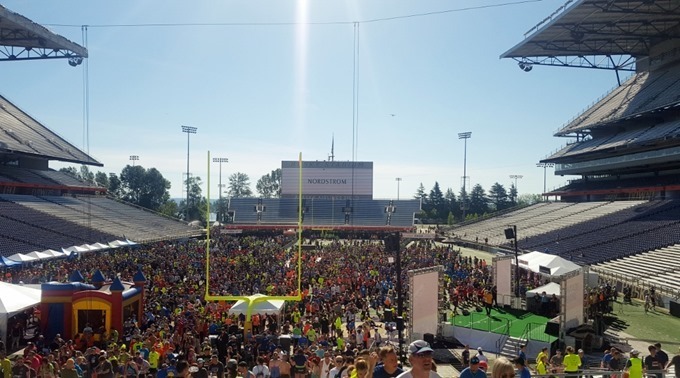 I didn’t actually realize how big of a race it was until we went to packet pickup on Saturday, and I saw the enormous race set up being constructed at Husky Stadium. It was fun to be there the day before and see the start and finish lines, and to get a sense of what the race would be like. Lacey picked me up bright and early on race day morning so that we could get there in plenty of time for the start. Summer weather has arrived in Seattle, and it was HOT even at 7am when we left. I knew heat was definitely going to be a factor during the run! I made Casey snap a before pic of us as we headed out the door! We watched the many thousands of walkers take off first. This race is a big fundraiser for JRDF — the leading global organization for type 1 diabetes research. I had registered through a team that was organized by some friends of ours who have a little girl Cullen’s age who has type 1 diabetes. It felt good to race for a good cause and to help friends meet their fundraising goal. It was the runners up next, and there were a lot of us! Over 4,000 as it turned out, and it sure felt like it. The start was somewhat chaotic, with runners being released in groups periodically, but no real rhyme or reason to pace or anything else. The announcements were really hard to hear. Eventually, we just jumped into a corral and decided to get started! Here goes nothing! My goal was to race my hardest, but also to not go out super fast for fear that I would crash and burn early. The longest I’ve been running is about 5 miles on long runs, so I knew better than to push it too hard since this was a 4.8 mile race. We headed south toward the Montlake bridge (which was super awkward to run on with the big metal gaps!) and looped all around through the beautiful neighborhoods back there. The race was really well done, but it was also REALLY crowded. I did so much weaving and dodging in and out of groups of runners. 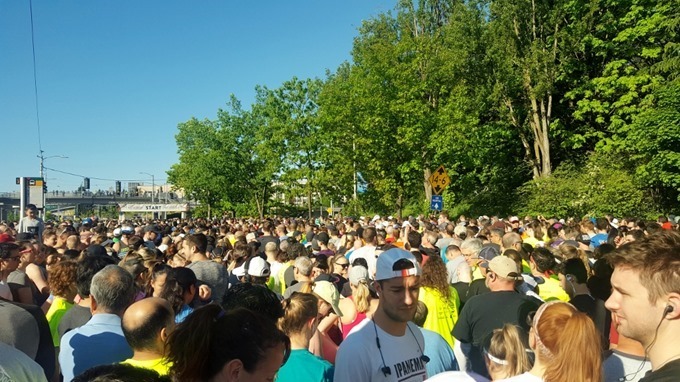 I wish with that many people there had been a better system for organizing paces, because there were a lot of strollers and walkers mixed in with speedy runners and people hoping to be able to race! My goal was to just keep Lacey in my sight and to not take any walking breaks. The first few miles felt pretty good, but by the second water stop I was dumping cups over my head. 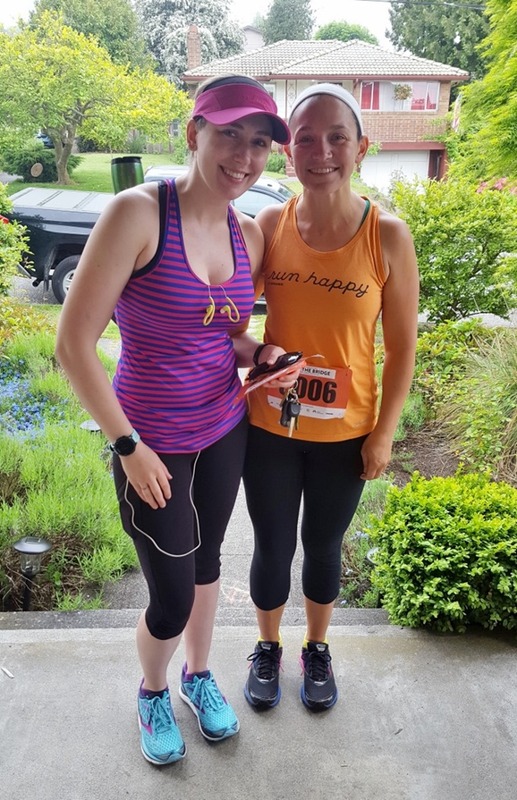 The course was in full sun and it felt SO HOT – especially after running for months in the grey gloom. I had to really dig deep to keep running and not walk, but I kept seeing my mile splits pop up and I knew if I could just keep running, maybe just maybe I could finish under 9 minute miles (which is pretty fast for me these days!). 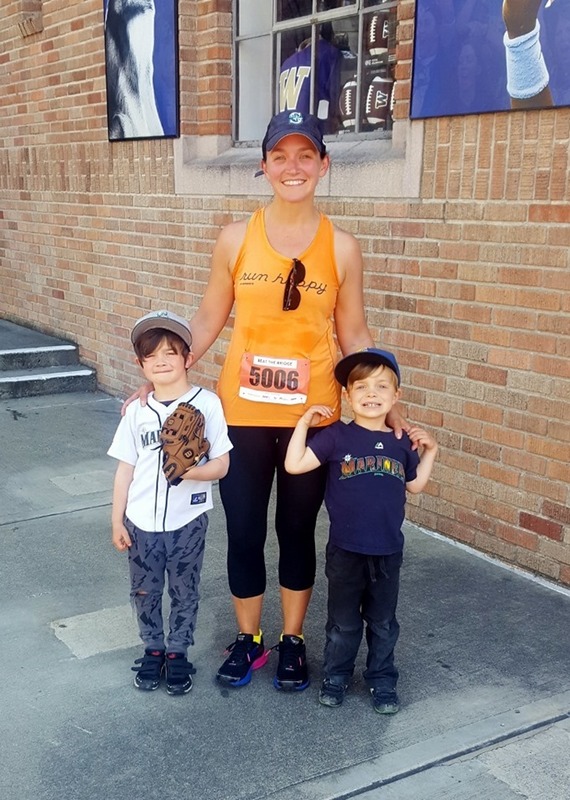 The last mile felt awful – I was pushing it as hard as I could possibly go, and it felt like it was never going to end. The course looped past the finish line and back around again, and I just kept staring ahead for the turn around point. 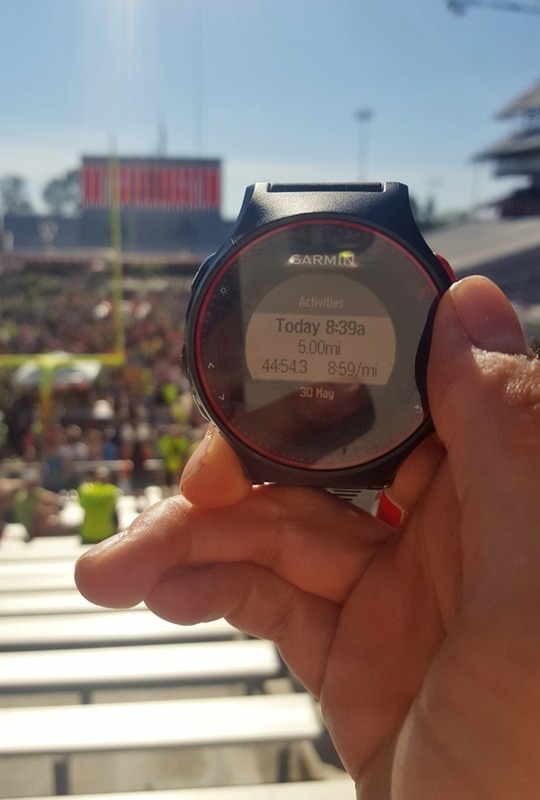 I finally made my way around the back of the stadium and I knew the finish line was right inside! As I went to turn into the stadium from the parking lot, I neglected to notice the speed bump I was running over and my tired legs got all tripped up. I went FLYING forward and did a very awkward tumble before totally wiping out onto my side. My arms and hands went down, my phone went flying across the pavement, and everyone around me stopped to help. It was SO embarrassing. I jumped right up and thanked them, and refused to even look down at my scrapes, but I could feel them stinging. I gave the last push I had to make it the 50 feet left to the finish line, and I tried to shake off my lame crash. I was completely exhausted after I crossed, but happy to glance down and see my splits! I found Lacey who had finished just behind me, and we made our way out of the massive crowd to find a place to sit down. I was SO glad it was over! Fun side note – I saw afterward that the winner of the men’s race was Garrett Heath – one of the Brooks Beasts that I got to have lunch with in Eugene last summer! I couldn’t believe how many people were there! It really was a fun event, and I would have enjoyed it more if I hadn’t been so wrecked from running in the heat. I cooled down for a while in the bleachers while we waited for Casey and the boys to find us. The run felt so hard, but it always feels so amazing to see my family at the end. I was really grateful to Casey for getting there despite all the street closures and crowds. The boys were super excited and Cullen immediately asked me if I had won the race when I saw him. No pressure, right? They were seriously hoping for some of that bouncy house action, but that was so not happening. Ha! I had a lot of mixed feelings afterward. On one hand I was really proud of myself for seriously pushing it and running all five miles with no breaks. I ran faster than I usually do on training runs, and it was a much hotter day than I’m used to. On the other hand, I was frustrated that the run felt as hard as it did. It doesn’t seem like five miles should be that tough with how often I run and work out. I have been asking myself for ten years now when running will feel easier, and I’m still waiting! But I’m glad I did it, and I’m looking forward to more races this summer and more chances to test my speed and my strength. Checked out my battle wounds afterward – OUCH. The biggest bruise was to my ego. Thank goodness there was no race photography! 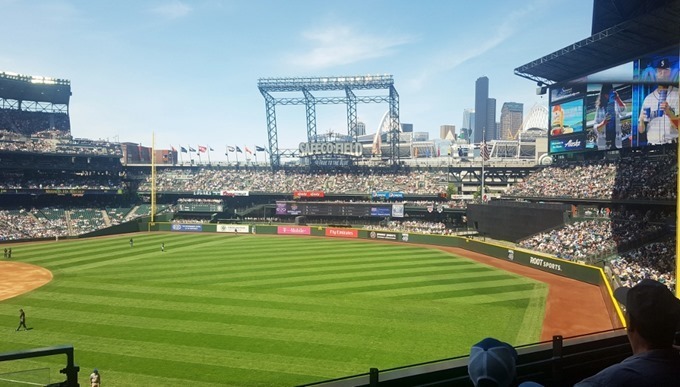 After a quick shower and some time to get ready, we spent the rest of the afternoon at the Mariners game. 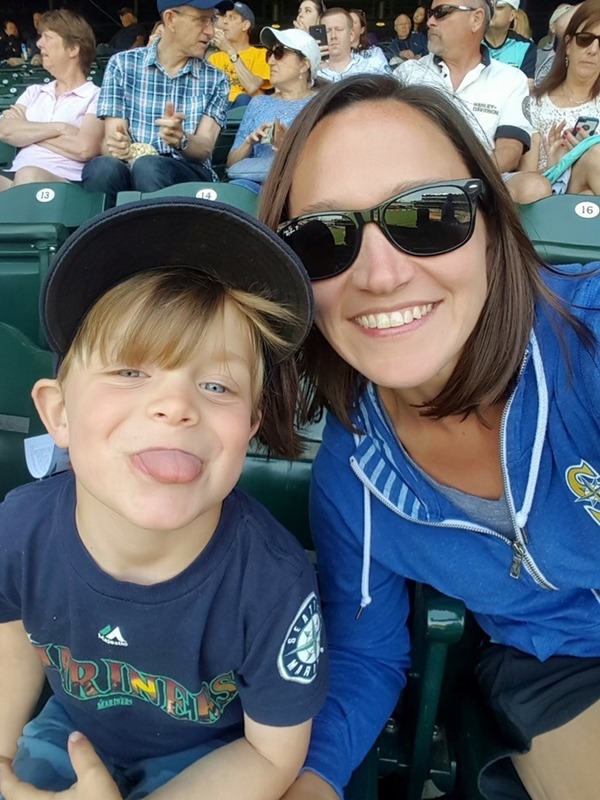 It was the perfect sunny day to be outside with my family, and I was happy to sit in one place for three hours! 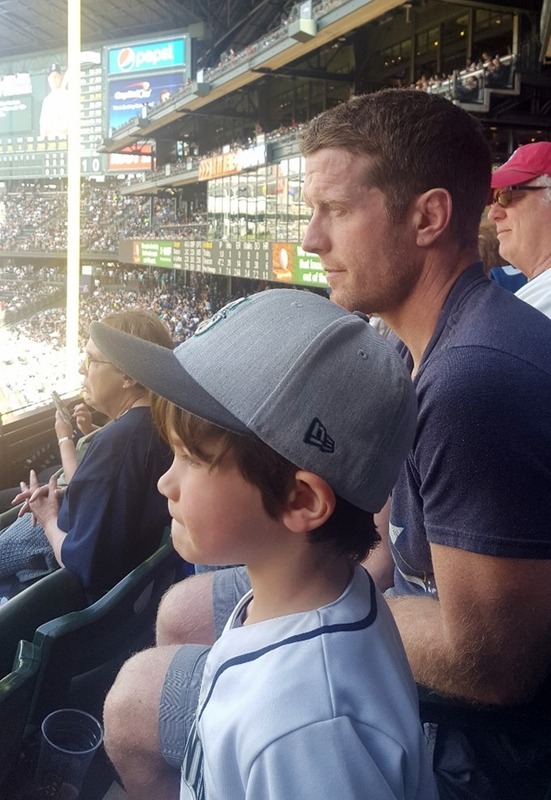 Love my baseball fans – such a fun thing for our family to enjoy together! 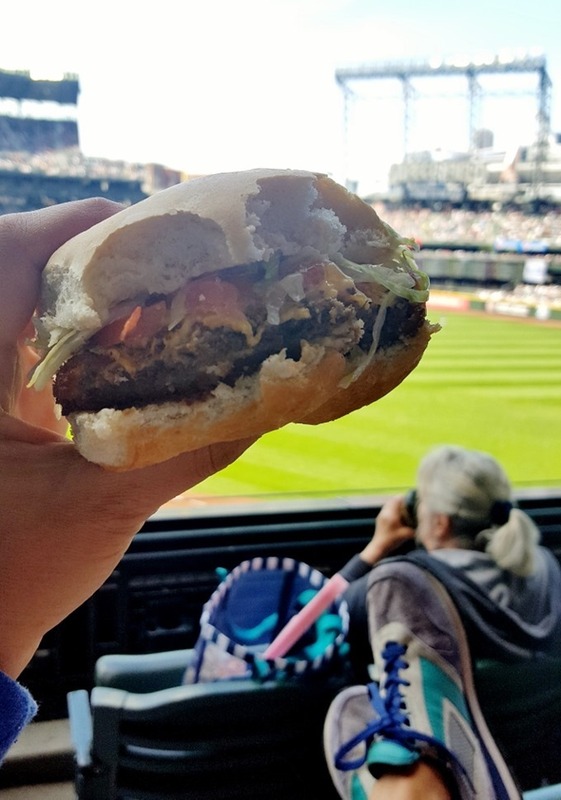 Finished up with the most AMAZING veggie burger from Great State Burger – well worth the walk across the entire stadium to get it. SO GOOD! A new ballpark favorite. Overall, a great race experience and a wonderful summery weekend! Looking forward to doing Race for the Cure 5K in a few weeks and seeing if I can push my pace a bit for a shorter distance! 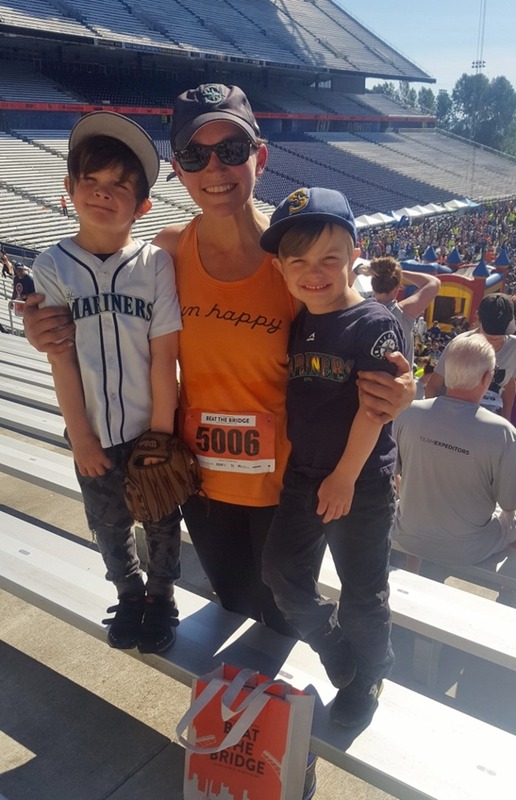 (Don’t forget – you can sign up to run with me using the code RUNWITHEMILY!). Hope you all had a great weekend too! And now, time for The Bachelorette – I am SO excited! « Previous PostOur Summer Garden! Next Post » Friday Food Finds! I always get discouraged with the summer heat (and I live in FL!) and then October/November comes around and I remember oh yeah, it’s the weather! We forget that we just can’t be as fast when it is so hot!! Great recap! Ugh – I feel you on the running never feeling that much easier. And the later I get into my 30’s the harder it seems. I will say that adding more strength training/weights and HIIT workouts into the rotation has really helped my running. But it’s still not easy! Why would they have you run over a speed bump?! And why would they let walkers go before runners?! I agree that it’s not a very well-planned race – especially for the number of people who showed up. Great job with your times!! I ran this race a few years ago and totally remember being annoyed at the end. I can see the finish line, why are you giving me an extra loop? Noooo! Haha, I also thought the bridge we had to beat was the Montlake Bridge, not the University Bridge. Of course you cross Montlake after like 3 min of running. I thought, well, that wasn’t hard at all. Ohhh, the OTHER bridge. Ok. Still beat it. :) Glad you (mostly) enjoyed it! Don’t discount the heat – after the winter and spring we’ve had, our bodies are definitely not used to it! I ran a trail race in Winthrop this weekend and the heat just about killed me after training in freezing drizzle these past months. Congratulations! Congrats! You did amazing! 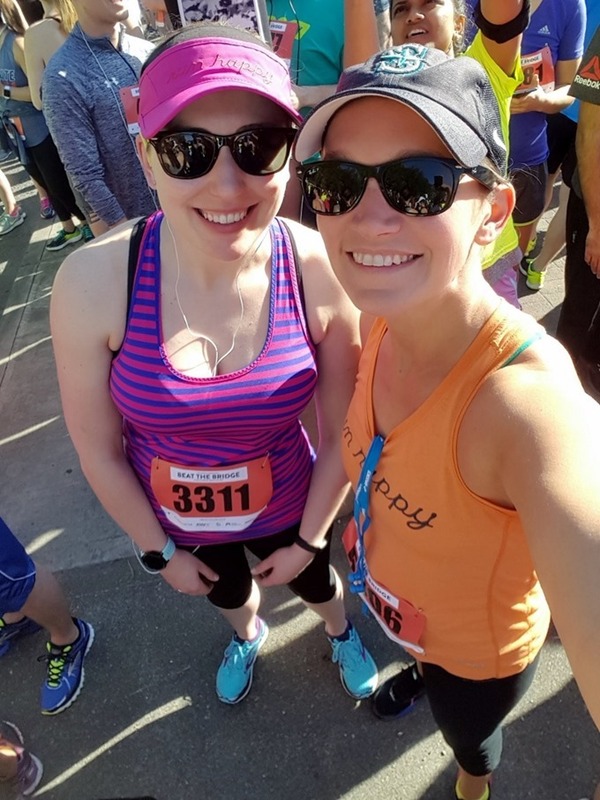 I ran the BMO Vancouver half marathon two weekends ago. I didn’t do as well as I would have liked. I beat myself up after and then thought “if it was easy, what would there be to work towards?”. I have set my sights on another race to works towards. One day I will get that new PR and it will feel amazing! I’m running my first runs in the 80s these days and it’s brutal. I’m used to running in the cold, 30s, 50s, I’m canadian! :) I take a cooling towel with me around my neck and drink, drink, drink. Way to go! Also, I can’t help but comment on the photo with you and Graham – your skin looks amazing! What is your secret? You are sweet! No secrets! Just wearing minimal makeup these days. I’m not good with beauty stuff! I totally know the feeling about being frustrated with your speed. I’ve been running for over 10 years and if anything, I’ve gotten slower! I think you did great and also, I can’t believe you have already lived in Seattle for 6 years! I remember reading when you lived in Charlotte! Amazing post! Go you for turning things around and taking those hard steps. :) Thanks for sharing. Well-said, Brit! I agree with everything you wrote! This is such an awesome comment and a great insight to how running and activities grow and change in many ways. Thanks so much for sharing! I just volunteered at a 5M race here in Boston to raise money for ALS. It was only in the high 60s so much different than your 5M! Your boys look so tall in these photos! That sounds like a great race! 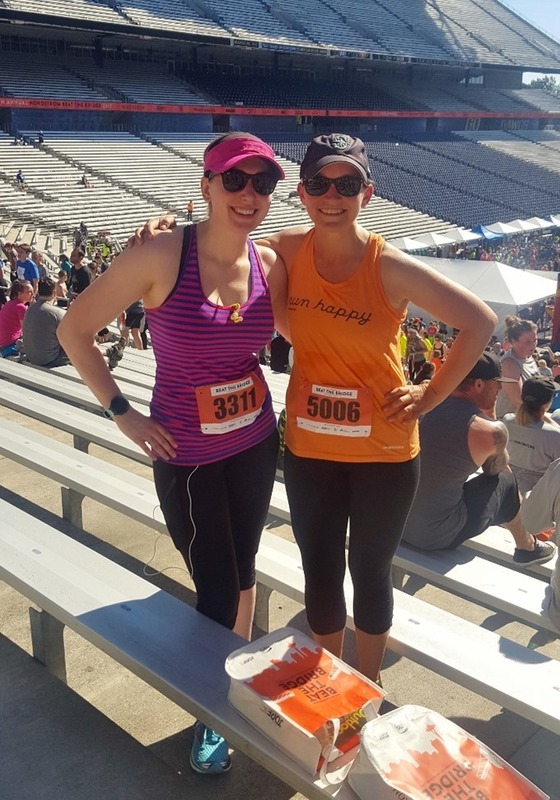 I’m looking for a race to sign up for in the Fall and haven’t done one in years…I’m sure it will be nowhere near my fastest, but I’m going to try to just soak up the good race vibes and enjoy being out there again. You should be proud of yourself!! In the photo with your veggie burger, are those your sneakers? If so which ones. Love them! They are! They are the Brooks Chariots, and I am obsessssssed with them. I have them in like five different colors!